Each year people throughout Illinois are discovering walking and biking as options for every day transportation, unleashing health, environmental, and economic benefits in communities across the state. Despite this growth, the Illinois Department of Transportation (IDOT) invests very few state dollars on infrastructure projects to improve conditions for walking and biking. Meanwhile, vast amounts of IDOT funds pour into road projects that benefit drivers and often lead to more congestion, pollution and inequity. 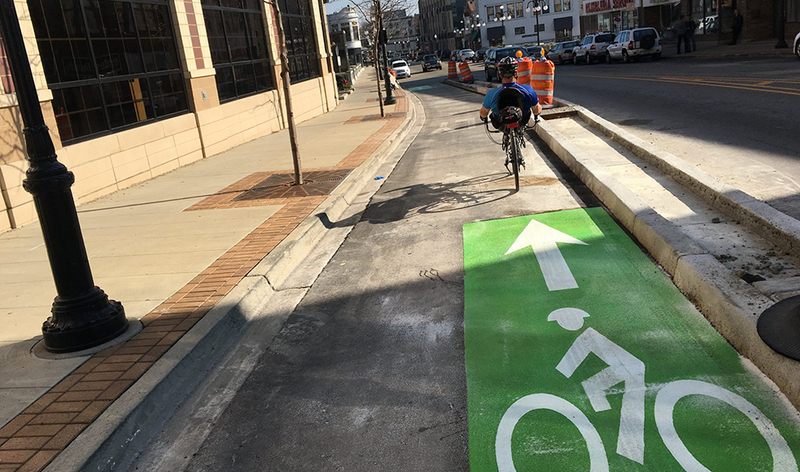 We call upon the next Illinois Governor and General Assembly to commit to spending a fair share of state transportation dollars for a new, dedicated Bike Walk Fund of $50 million per year, which is only about 2% of transportation capital spending at IDOT. This is in addition to federal funds that funnel through IDOT for walking and biking. This fund should be used for new biking and walking projects on corridors where the most crashes occur, many of which are located in low-income communities and communities of color. Historically disinvested communities with the greatest barriers to biking and walking must be prioritized with any new funding. Support an Illinois Bike Walk Fund by taking action today.